It is imperative that you first read our Suicide Squad (Mission X version) profile first, or you won’t understand jack. The material is really interesting, but there are… complexities lying in ambush. 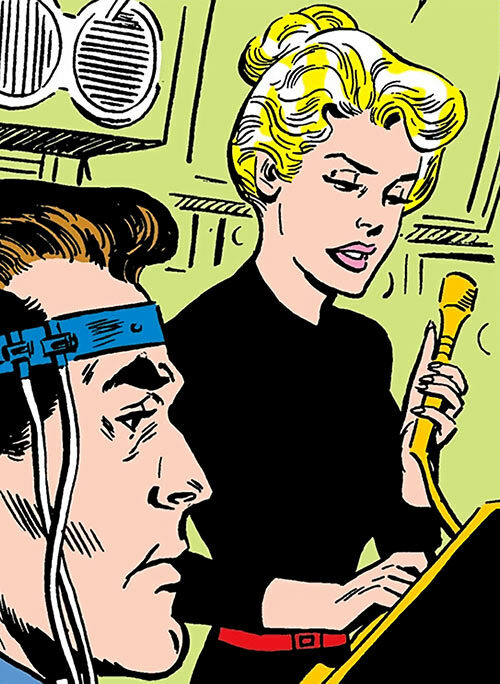 Real Name: Dr. Karin Grace. Other Aliases: “The ice doctor”. Group Affiliation: Mission X’s Suicide Squad ; Task Force X ; Manhunters cult ; Amanda Waller’s Suicide Squad. Grace is presented as a medical specialist. In the original take she’s a military nurse specialised in flight medicine and air rescue. In the revised take she seems to be a MD from an Air Force air rescue unit. Then she left the service and joined the NASA to help develop space medicine for astronauts. In the original stories, her medical skills are seldom demonstrated. Since it’s not a genre with lots of wounds and death. Grace also serves as Flag’s co-pilot, radar navigator and bombardier. She may have other signature Air Force skills such as playing Farmville whilst drinking coffee. These and getting captured are her two most apparent skillsets in the vintage stories. But Dr. Grace also has three more subtle assets. The first is that she cheers the men onward and motivates them. Presumably because they don’t want to look weak in front of a *girl*. In DC Heroes RPG terms, she has the Cheerleadership Advantage. She uses it through the Dream Team Advantage, making her the Hero Points pivot of the Squad. Like in team sports, her role as a pivot is not to score and do flashy stuff. Rather, she makes sure that the ball ends up in the right hands at the right time. Other Squad members give their Hero Points to Karin so she can bolster them. Then bestow them to the point man so he can save the day. The second is that she’s gorgeous. Thus, most male things (including giant monsters such as Ancient Greek cyclopes) will get distracted and focus on her. This leaves the men free to do Manly Things™. The third is that she displayed a quasi-supernatural level of psychic sensitivity in one vintage story. This is noted in her DC Heroes stats as a couple of Awareness APs. But the gamemaster should feel free to have Grace simply sense “telepathic emanations” or somesuch to provide a quick start or clue during an adventure. 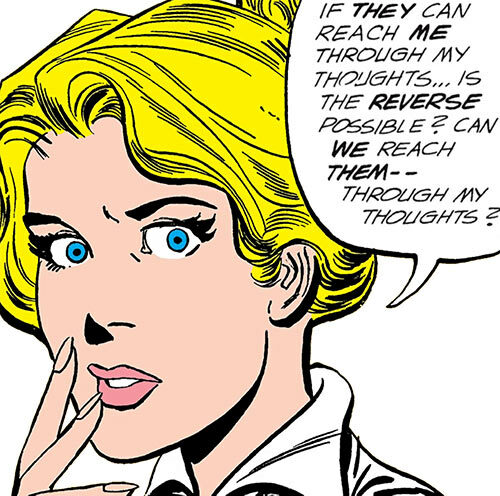 In the published story she was able to sense hostile intentions from telepathic dinosaurs in another dimension. 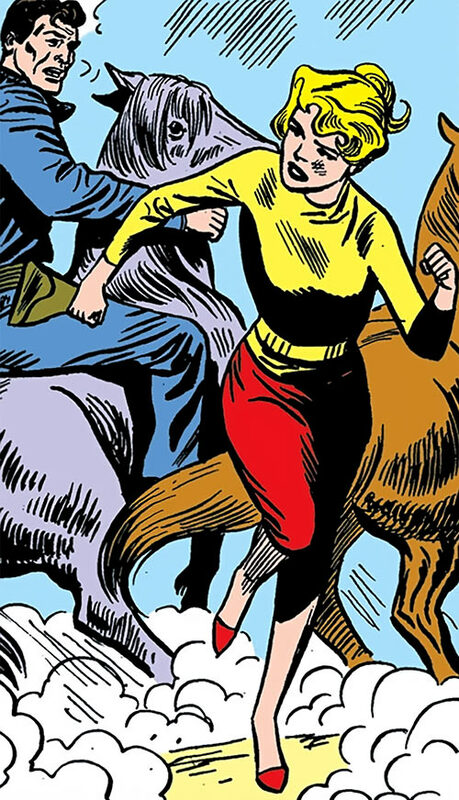 She then concentrated to transport the entire Squad into that dimension by “riding back” those psychic waves. As you do. Karin Grace doesn’t have a complex personal continuity. But there are nevertheless different takes about her. This is a result of acceptable portrayals of female characters between 1959 and now. The original depiction was a very passive character, conservative even by 1959 standards. 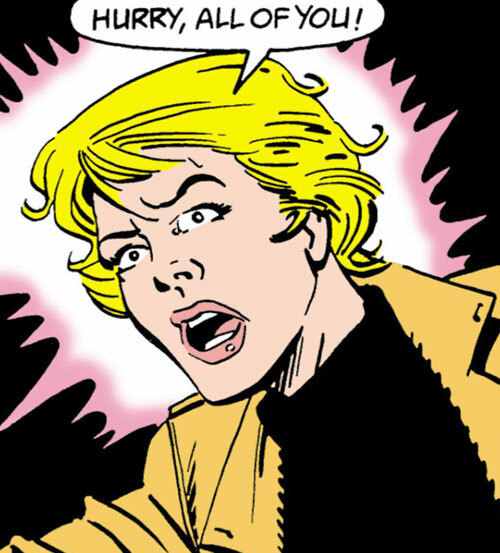 From what little is seen of the 1980s post-Crisis version, Grace was more of an active character. She had more agency and actual skills as a field operative. She’s now a medical doctor, not a nurse as the 1959 version. She’s also seen wielding and using firearms — an important signifier in action stories — though she and Doc Evans prefer lighter, simpler weapons. They tend to have Colt M1911s and perhaps M1 carbines. Whereas Bright and especially Flag will use heavier military weaponry such as submachineguns and assault rifles. 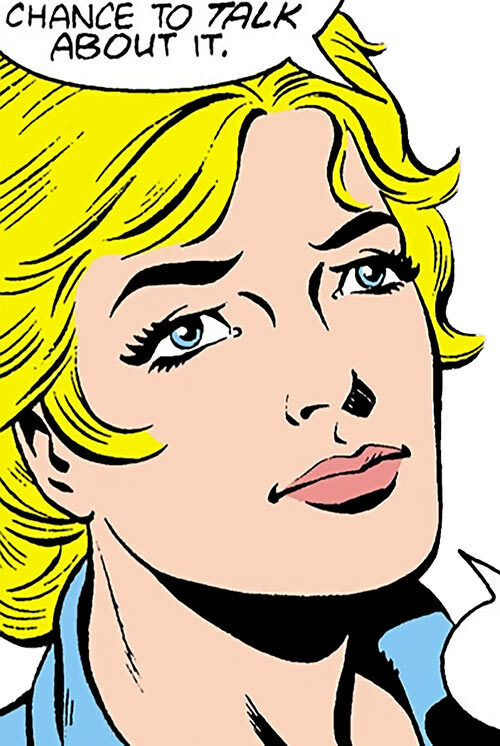 Later depictions of Karin Grace (say, in the New Frontier continuity or in a recent Booster Gold adventure) continue this progression. They depict her as having a strong personality and being as capable as the rest. The game stats in this profile are based on the abilities of the original character. Then we added more forward social, physical and martial skills as per the 1980s version. This is a murky compromise and something that we generally avoid. But given the unusual continuity situation and the low amount of material it seemed to be the least bad approach. Performing precise parachute drops in full US Airborne kit along with the men. Operating as a combat diver. Thus, that more liberal times would have her using personal weaponry and performing more musclebound exploits (such as the difficult mountaineering depicted in the flashback in Suicide Squad #50 as the Squad exfiltrates from Cambodia, or even… wearing trousers !) is a reasonable assumption. Again, this entry is meant to be read after the Suicide Squad (Mission X version) article. It may have occurred in the Pacific in 1945 (original timeline). It may have occurred during the mid-1950s in Việt Nam (our proposed timeline). Or it may have occurred in the mid-1970s during the closing months of American involvement in Việt Nam (the most logical date for the 1987 timeline). Little is stated about Grace’s military career. 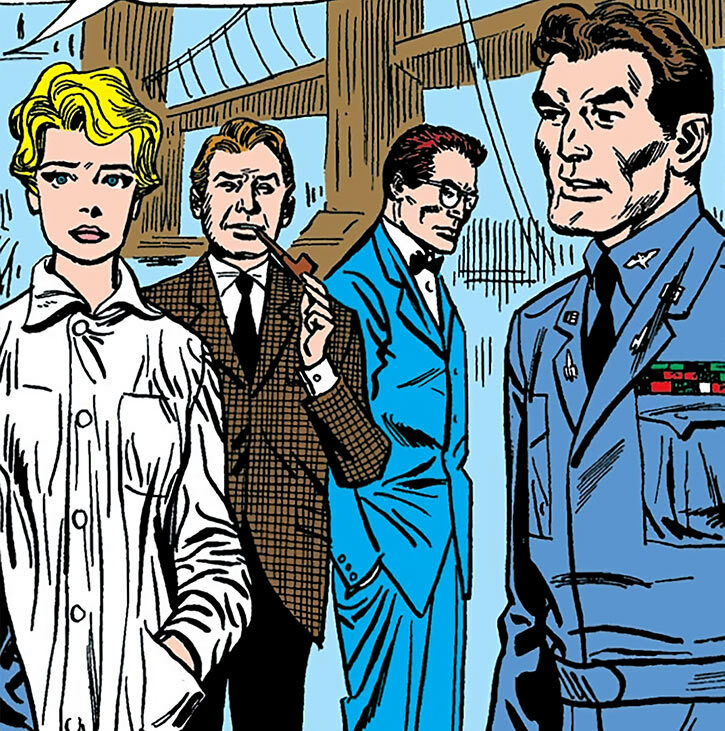 We have *assumed* that in the original timeline she served in Pacific (and was presumably Navy). Because the flashback happens at sea. Yeah, this is flimsy. 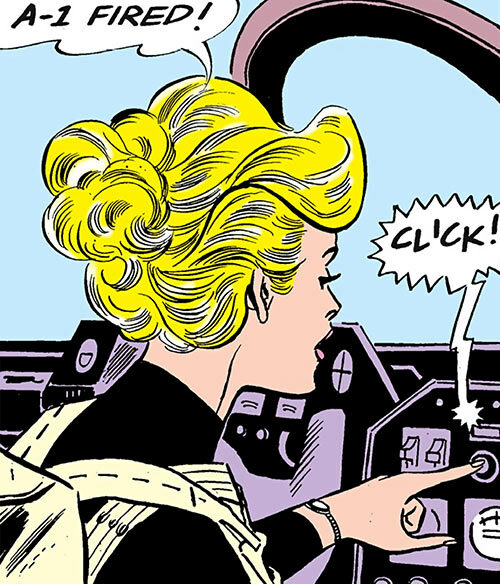 Likewise we have assumed that she was USAF in the later timelines (our own and the 1987 one). But the only bit of information to base this on is that her lover Steve is called “a flyboy”. Which is almost as flimsy. We’ve applied our general rule not to take clues from the uniforms drawn. Those are almost never correct. Official experiments in search-and-rescue air operations for the US Navy started in early 1943. These were a success. As a result, such operations were quickly scaled up until the end of the war. The air rescue aircrafts were nicknamed “Dumbo”, after the cartoon elephant from the 1941 Disney film . Their deployments became known as dumbo ops. In the original timeline, Nurse Grace logically would have been a graduate of the very first class at Navy Flight Nurse School in January of 1945. This would also make her a US Navy Ensign. As a Flight Nurse she would have been both a qualified military nurse and a rescue swimmer, explaining her fitness to serve with the Squad. A caption describes her war record as “striking”. Perhaps it went along the line of real-world Ensign Jane Kendeigh at Iwo Jima and Okinawa. So she may have been a Lt. by the war’s end. In our proposed timeline, Dr. Grace would have been one of the first female MDs to serve in the Air Force. She would have joined the earliest form of the 33rd Air Rescue Squadron . It was formed in 1952. The earliest American “consultants” working in Việt Nam came from Okinawa bases. Thus it is reasonable to assume — in the context of a fictional universe — that early, off-the-record aeromedical rescue operations in Việt Nam would have been flown by the Okinawa-based 33rd ARS. In this timeframe Dr. Grace would presumably have been a 0-1 (2nd Lt.). But given the times it is unlikely that she was ever promoted past 0-2. With the hostility toward the possibility of female pilots her qualifications as co-pilot, bombardier and navigator would likely have been acquired on the side. 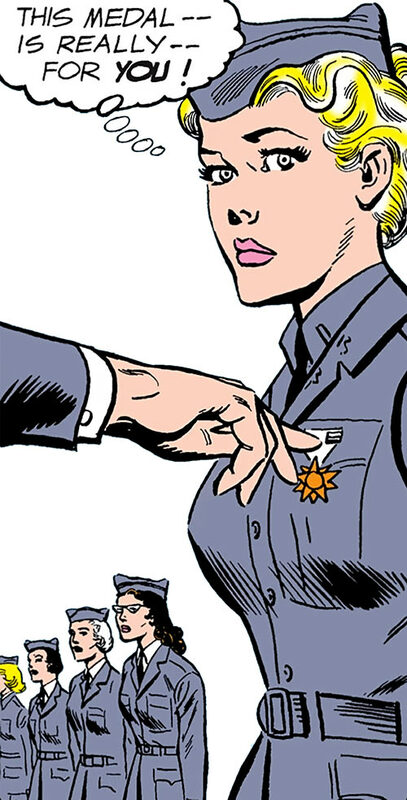 See our first Carol Danvers profile for notes about women’s organisations in the Air Force. This timeline makes likely that Dr. Grace would have been loaned to NACA (the precursor of NASA) in 1957 as part of Special Committee on Space Technology . 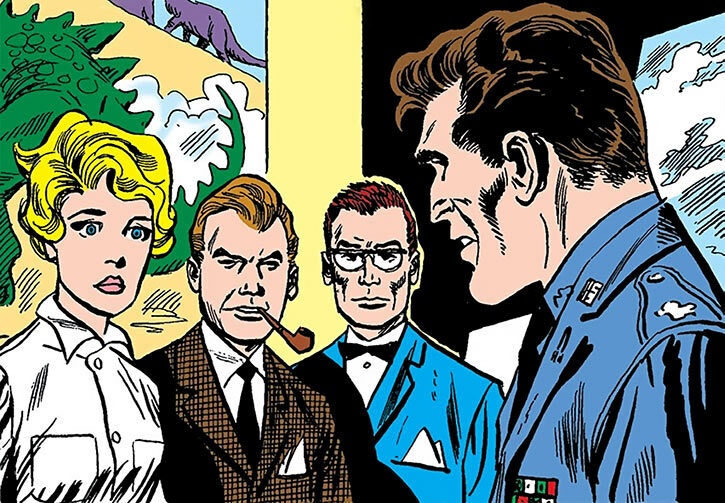 *If* we assume that NACA’s SCST were more extensive in the DCU than in the real world, which is reasonable. She could thus have met Flag — a military consultant to the SCST — in early 1958, one year before the Squad was launched. In the post-Crisis timeline things would be broadly similar. Howbeit the 33rd had by then become the 33rd Aerospace Rescue and Recovery Squadron. The mid- and late 1970s saw the bulk of the legal changes allowing women to serve in an integrated manner. So 1st Lieutenant Grace might have been formally trained as a backup pilot, bombardier (to drop rescue boats), etc. a few months or years before joining the Squad. Dr. Grace might have met Rick Flag during the January, 1978 space shuttle astronaut candidate recruitment. This would be roughly a year before the Squad was formed. 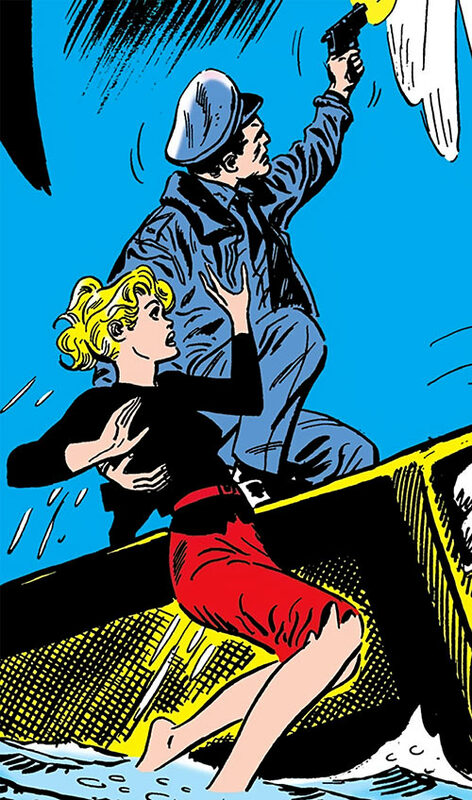 In the post-Infinite Crisis timeline, 1st Lt. Grace would presumably be a CSAR -qualified aeromedical crew director attached to the USAF 24th Special Tactics Squadron. 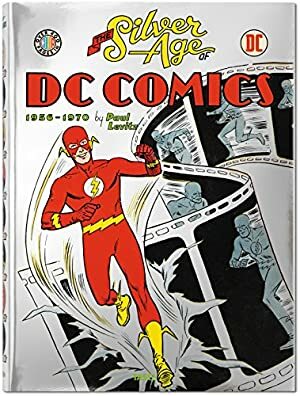 The bad stuff would have happened during the DCU version of Operation Gothic Serpent in Mogadishu . These 1993 events were made famous by the (historically inaccurate) Blackhawk Down movie . 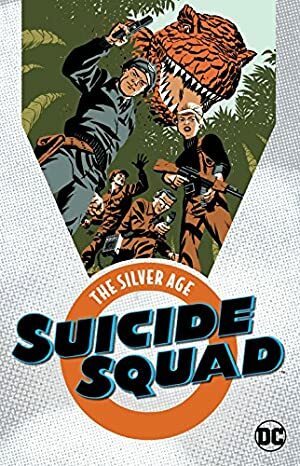 In this timeline, Dr. Grace presumably meets “Rick Flag” (actually amnesiac soldier Matthew Miller) after she is recruited in 1997 by General Eiling’s men to join a new version of the Suicide Squad. From context, Grace has probably been lied to and manipulated. This conditioning would have exploited her state of shock over what happened in Mogadishu to feed her false information and make her exceptionally determined to serve. After this tragedy Grace carried on, working as a physician for aerospace pilots. She was nicknamed the Ice Doctor due to her cold aloofness since losing Steve. She eventually met with Rick Flag, bonded with him over their shared sense of loss and duty, and joined the Suicide Squad shortly after he did. The group dynamics of the Squad revolved around Grace. Flag was secretly Grace’s lover. But the two other men were also in love with her. Thus it was feared that, given everyone’s unusual psychological state, they’d crack if she rebuffed them. This uncomfortable situation continued for years as the Suicide Squad improbably beat threat after threat and defended the free world. Pre-Crisis, the Squad dispersed right after discovering a strange golden temple in Cambodia. Karin Grace was never heard of again. Post-Crisis, the mission in Cambodia was even more of a disaster. Jess and Doc Evans apparently died trying to stop a yeti. Karin blamed herself since the men were trying to save her as their first priority. Flag got Grace out of Cambodia, but she had finally reached her breaking point. She was flown back stateside. That left Flag alone, despondent and volunteering for even more suicidal missions. Dr. Grace recovered to some extent, but apparently never renewed her relationship with Rick Flag. The doctors treating her soon asked Flag to stop visiting her so she could move on and leave her traumas behind her. As a result, Grace and Flag eventually lost contact. Weeks later the medical staff realised that Karin was pregnant. According to Waller, Grace had a further breakdown upon learning this. Though she carried to term, she blocked the existence of her child from her mind. In the 1987 timeline, Karin’s son isn’t problematic. He presumably was born in 1984, and he does look about 6 in the scenes published in 1990. In our proposed timeline, however, he’s the one point that doesn’t work. This is because he would have been born in 1965, making him 25 by the time Koshchei sent zombies to capture him. For those interested in using our timeline in their campaign, there’s a fix. But it will be detailed in the Rick Flag entry. Though Grace recovered her composure over the years, everything was handled disastrously. Flag abandoned Grace even after it became OK for him to visit her. From dialogue it seems that it was a mixture of him being poorly informed about Grace’s state by the military and a mostly-subconscious wish to avoid her. Grace blamed Flag for this. She came to harbour a low-key desire to hurt him back, since she had also blocked out the good parts of her history with Flag. General Stuart arranged for Karin’s son to be adopted by friends of his, the Kanes. However, he never informed Flag that he had a son – since he feared that Flag would also break down. It is possible that nobody ever told Grace either, given her unstable state. Grace presumably ended up rejoining the US Air Force as an air rescue doctor. By her next appearance her skills were again current and reputed. After leaving the hospital, she met with the adventurer Mark Shaw. He was then known as the Privateer and associated with the Manhunters cult. After becoming Shaw’s lover, Dr. Grace was inducted into the cult. She became a Manhunters plant within the armed forces. 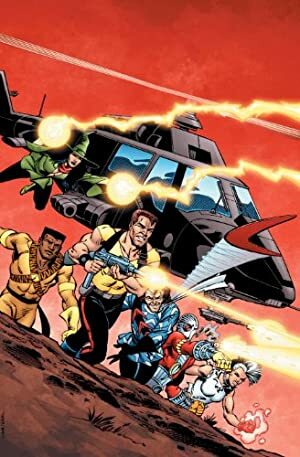 In 1986, Amanda Waller was authorised to create an entirely new version of the Suicide Squad. To hasten operations, Waller grabbed a few resources from the previous version of the team. One was a mostly intact SS-1 special purpose aircraft. It was retrofitted to become a fast transport airplane. Another was Dr. Grace, whom she approached to head the emergency and combat medical operations of the Squad and help fly the SS-1. Always willing to serve, feeling that she owed Jess Bright and Hugh Evans, and seeing an opportunity to hurt Flag, Karin agreed to join the Squad. She became part of the ground crew in Belle Reve, LA. Karin Grace was back to her “ice doctor” persona. She did not really care whether the ill-defined ends justified the occasionally heinous means the new Squad employed. For instance, she didn’t bat an eye when it came to using Dr. Moon’s technology to force a washout, Plastique, to forget the existence of the Squad. Grace was also occasionally active in the field as a support agent. One example of this was the operation to break the credibility of bigoted “hero” William Hell. Dr. Grace also flew the team out of USSR after the semi-failure of the Firebird operation – and provided immediate medical attention since most members were in a sorry shape. Dr. Grace occasionally provoked Col. Flag with accusations of having abandoned her and/or Jess and Hugh. She knew that Flag wasn’t her boss – Waller was. Flag soon cracked and wanted to confront the passive-aggressive Grace to tell his version. But Waller ordered him not to. Flag refused the order. This led to a fists fight with the Privateer (Mark Shaw), whom Waller had recently recruited. Flag was defeated. When Shaw made a vague pass at Grace, Karin showed clear interest in order to hurt Rick. Though Karin thought that Mark was just maintaining cover by pretending not to know her, he was sincere. *This* Mark Shaw was not the real one. Unbeknownst to her it was an android double. During the Millennium crisis , the government was reluctant to activate the Suicide Squad. But the menace essentially came to the Squad as activities by the Manhunters cult were reported near Belle Reve. Belle Reve’s warden assembled a team. He arranged to have a very powerful car bomb issued to them. The Manhunter forces being chiefly androids from outer space, any base of theirs in the bayou was expected to take extraordinary force to raze. Briefed about the bomb, Grace volunteered to accompany the team in the field. She considered that operatives may be caught in the blast of such a powerful weapon and require immediate medical attention. On the team was also Shaw – the real one. 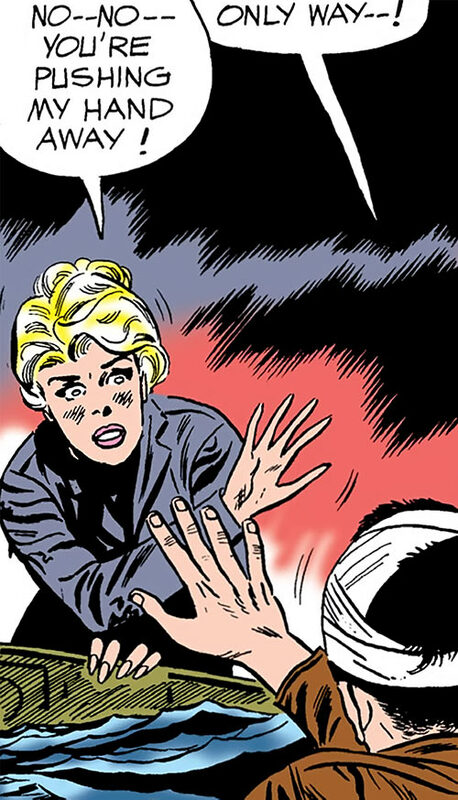 During the assault on the Manhunters temple, Grace faked being captured by the aliens. She then arranged for a trap, planning to take Flag out before he could drive the bomb into position. Grace lured Flag in to “rescue” her despite Shaw’s warnings that it was a trap. Grace held Flag at gunpoint and spat out the truth about her Manhunters affiliation in his face. But to her utter surprise, Shaw disarmed her. The Privateer explained that whoever the Mark Shaw she had lived with for several years was, it wasn’t him. A Manhunter then came in, claiming that he was the real Shaw. He said that the Privateer holding Karin’s gun was the android. He gave his weapon to Grace so she would execute Flag and Shaw. But as she held the baton Karin realised that something was wrong. She started to remember the good times she had spent with Flag rather than just the bad, no longer suppressing her recollections to deal with her traumatic condition. As she refused to fire, the Spectre magically struck at all Manhunter androids. As a result the fake Mark’s circuitry broke down, making it clear that Karin had been deceived by the Manhunters all along. Coldly furious, Dr. Grace determined that she was the best-placed person to deliver the bomb, as she knew the layout of the Manhunters’s temple. As she revved up the engine she asked the real Shaw to tell Rick that she now remembered their full history, and that she asked for his forgiveness and for him to carry on in her memory. 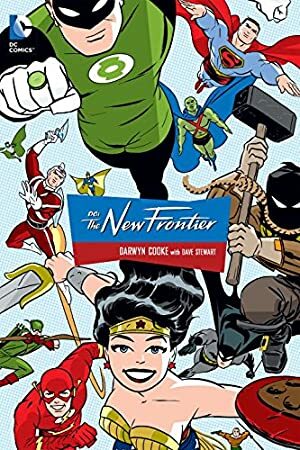 Though she discovered that hostages were held in the gigantic Manhunters temple, two other adventurers had snuck into the Temple – Jim Corrigan and Batman. Batman told Grace he would get the hostages out. After a short discussion Karin resumed driving the car bomb where it could annihilate the temple. Though damaged, the Manhunters androids did all they could to prevent Karin from driving the bomb to the heart of their main temple. They eventually managed to crash her car. It was too late though – the bomb would detonate within seconds. Spotting the android who had duped her, Dr. Grace cursed him. The bomb exploded, dealing a crippling blow to the Manhunters’ plot against the Human race and the Guardians. 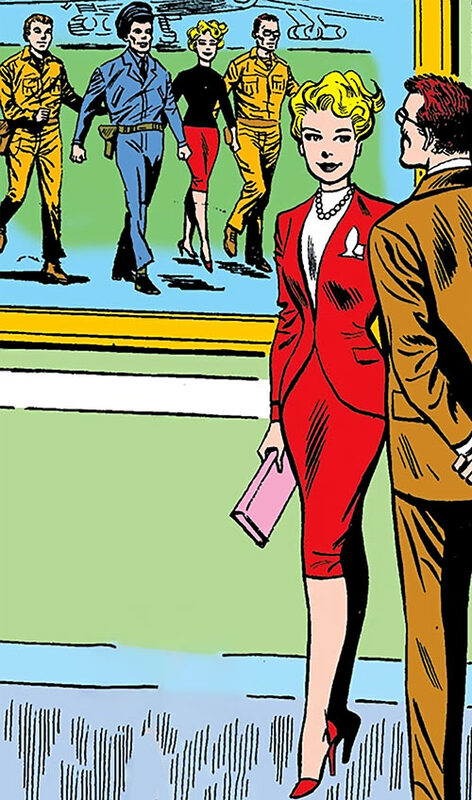 In the original stories, Grace is usually dressed in a way completely inappropriate for field work but appropriate for a late 1950s American woman. She usually sports a red skirt that ends below the knee and a blouse, plus light heeled shoes and perhaps conservative jewellery such as a pearl necklace. The few shots of the 1987 post-Crisis version have her dress more sensibly. Examples include a black high-necked sweater, red fatigues and hiking boots, or a US Air Force jumpsuit and supple combat boots. She’s an air rescue doctor Jim, not a fashion plate ! When she worked along the Suicide Squad field team she wore a S.H.I.E.L.D.-style black bodysuit. It had a handgun — presumably a Colt M1911A1 — in a grey-blue shoulder holster. In the original appearances Karin is more an object than an actor. She has but a few lines of dialogue, though she says “You’ve done it Rick !” about three times per story. Everyone’s characterisation was minimal and the emphasis was on the weird tales. She was the stock demure female who got captured and was there for the guys to obsess over. What her characterisation would have been in the post-Crisis is not known. But after Cambodia she’s obviously hurt and psychologically crippled. What happened is unclear, but she has blocked practically all her positive memories, perhaps so she could move on. This leaves her bitter, hateful and passive-aggressive about her past. Though she wanted to let go and get a life, Dr. Grace was still bound by duty. As a former Squad operative, as a doctor, as an Air Force officer and even as a Manhunter. Her whole life was dominated by the necessity to serve, no matter how badly she wanted to retire. Part of the theme of the team is that they were abnormally driven by tragic circumstances. This made them able to unhesitatingly face disastrous odds for the common good. However, this great strength stemmed from psychological trauma. Thus, there was a tiny but constant chance that somebody might crack (in DC Heroes RPG terms, Minor Psychological Instability). This wasn’t too present in the few original stories. But the sense that someday, somehow, somebody’s ghosts would catch up with them and everything would go wrong was present in the post-Crisis version. Squad members were driven by an unusual sense of Responsibility, though in practice their actions were of Upholding the Good sort. They felt personally, deeply responsible for carrying on in the name of their comrades after terrible tragedies. No Squad member made attempts to rationalise away, forget or shirk what had happened, and took-on a life-changing, 24/7, to-the-death duty ever since. Attractive, Cheerleadership, Credentials (US Military, High ; NASA, High ; US Intelligence, Medium ; NATO militaries, Medium), Dream Team (with Rick Flag Jr, Jess Bright and Doc Evans), Expertise (Parachuting, SCUBA diving). Mission X (High) plus those derived from her Credentials. MIA toward Rick Flag, Minor Psychological Instability. See the corresponding Suicide Squad article. Attractive, Benefit 2 (Mission X operative, giving her senior credentials with NATO military, intelligence and aerospace agencies), Connected, Equipment 3, Inspire, Leadership, Luck. You did it Rick! Karin is Rick Flag’s lover, but nobody must learn of it ! Later on, this is replaced by a toxic hatred of him based on mangled memories. Our lives do not matter! The Squad operatives are impossibly driven. They are entirely willing to sacrifice themselves if necessary. Damaged The Squad operatives have been through severe psychological trauma. There are discreet but fragile fault lines in their psyche. Ladylike In early takes Karin is passive and demure, and only gets to do girl stuff. But actually she’s reaping the Hero Points from this constant Complication, and use them via Leadership and Inspire to buff the others ! The little minx ! Trade-off areas. Attack/Effect PL 5, Dodge/Toughness PL 3, Parry/Toughness PL 3, Fort/Will PL 4. Points total 70. Abilities 24, Defences 10, Skills 19, Powers 2, Devices 0, Advantages 15. Equiv. PL 5. Yes, the “Trained CSAR” Power *is* fiddly. It’s just that I didn’t want her to hop and dash around like Lara Croft. The Suicide Squad members have fairly good Hero Points total in DCH. So a level of Luck seemed about right to model the story flow. Since in DCH they use their HPs not to miss mission-critical rolls. Her equipment pool doesn’t include the shared cost for their special plane, which I haven’t M&Mised yet. Also, her Equipment pool will definitely be larger if you go for the New Frontier view of the character, where it’s entirely possible for her to come to the party with a flamethrower or a bazooka. As discussed in the article these are Frankenstats, smushing together several takes on the character due to the paucity of material. Her attack PL assumes a Light Pistol. Writeup completed on the 17th of August, 2011.